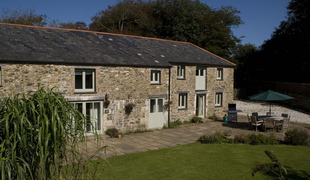 Moo Barn is a luxury self-catering cottage, located on the Roseland Peninsula, Cornwall. Moo Barn sleeps eight people and all rooms are en-suite. It has been a happy holiday destination for many people since 2004. It is a large, relaxing and beautiful luxury barn conversion set peacefully at the end of a private lane, surrounded by organic farmland in the heart of the unspoilt Roseland Peninsula. There is a large walled garden; well groomed and with comfortable furniture, it is a safe place for the children to play and the adults to unwind over a glass of wine and a barbeque during the long hot summer evenings. 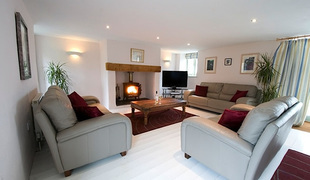 Moo Barn is spacious accomodation which also feels cosy and rustic, with exposed roof beams and the opportunity to relax in front of a log fire. It comfortably sleeps up to 8 people, plus up to two cots. 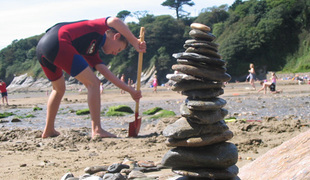 There are accessible, child friendly beaches within a ten minute drive, (close enough to be easy to reach, yet far enough away from the madding crowds to not have the hustle and bustle on your doorstep), each one has an affordable car park nearby.